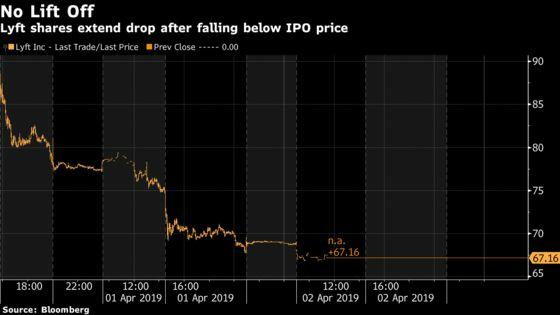 (Bloomberg) -- Ride-hailing company Lyft Inc. continued its slump Tuesday, falling as much as 3 percent in premarket trading, after having closed below its $72 public offering price in regular trading on Monday. The slump is a worrying sign for other unicorns that plan to list this year. Lyft’s IPO was seen as a test case not just for rival Uber Technologies Inc., but for a glut of highly valued startups like Pinterest Inc., Postmates Inc. and Slack Technologies Inc.
Lyft was trading at $66.96 at 6 a.m. in New York, having closed at $69.01 Monday.